Election year is the traditional time when the air smells of fresh paint and asphalt, newspapers headlines announce funding for school repairs and new hospitals, and if you listen very carefully you can hear the sound of ribbons being cut. In British Columbia, they even have a term for it “Black Top Politics” – with key ridings getting fresh asphalt to show the government working for them. Around the world this roller coaster approach to funding infrastructure is just one thing that has held the infrastructure sector back. Decisions made by governments shape the market for infrastructure and if we are to get better value in the long-term governments need to change their ways. This was not the only challenge. Ontario faced several challenges in delivering infrastructure. Challenges that are not uncommon elsewhere: the ever-present budget pressures; a track record of spiralling project costs and delays; and a lack of coherent planning. To top it all off building infrastructure just was not popular for politicians – committing to something that the next guys get credit for and dealing with the negative headlines if things go wrong. 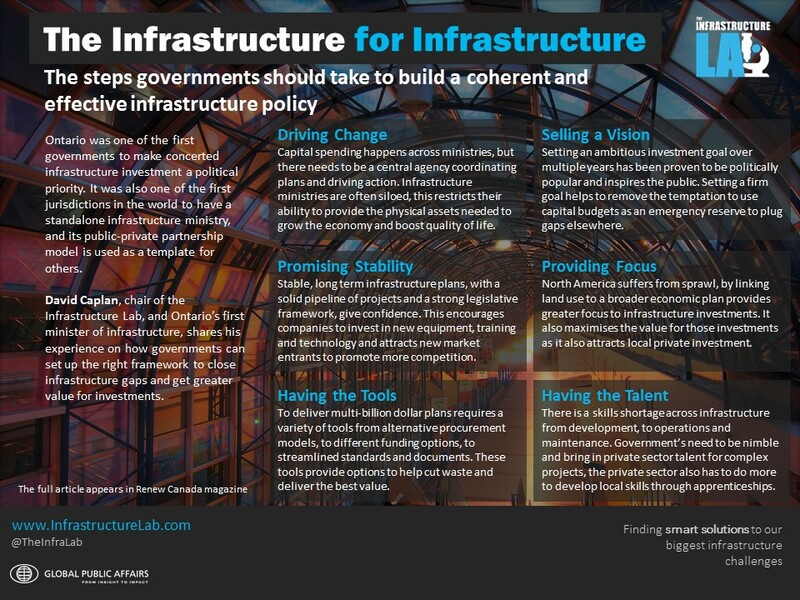 Driving Change – The infrastructure ministry needs to be the one driving action. To do so it needs to be a central agency with oversight of others and not operate in a silo. Given that all ministries have capital spending, and their actions are all linked in some way, they need to be coordinated. As originally envisaged the Ministry of Public Infrastructure Renewal was designed to steer rather than row the boat, as a ministry it does not need to be full of people, it just needs to provide direction and coordination working with ministries with capital budgets, and make sure actions are being taken. Selling a Vision – Faced with another raid of the capital budget, our ministry was faced with presenting a box of cobwebs as our contribution at budget time when it came to new project announcements or spending commitments. We had to be creative and collated all the capital spending across ministries and instead announced a $30 billion commitment over five years. The public response to this commitment was very well received and stable infrastructure investment became the smart political move. In many respects, it changed the landscape. Any government serious about investing in infrastructure needs to present a vision that inspires the public. Promising Stable Investment – In 2005 we introduced Renew Ontario which provided a coordinated view of where the province should focus its infrastructure efforts around population and economic growth. Stable, long term infrastructure plans provide certainty for industry and residential investment. Having the confidence that multiple projects are in the pipeline to bid on encouraged companies to invest in equipment and skills for the long term, it also attracted new market entrants. This stability and predictability is absolutely critical. Providing Focus – Ontario is three times the size of Germany, and without some restrictions on where to build, there will inevitably be sprawl. This sprawl makes it very costly for governments to deliver services and infrastructure. While Renew Ontario provided the investment plan, Places to Grow provided a framework for future growth and land use. This helped protect farmland, and promote more intensive development around population centres. It also shaped decisions on where to locate transit and other public infrastructure, like sewer mains, schools, and hospitals. 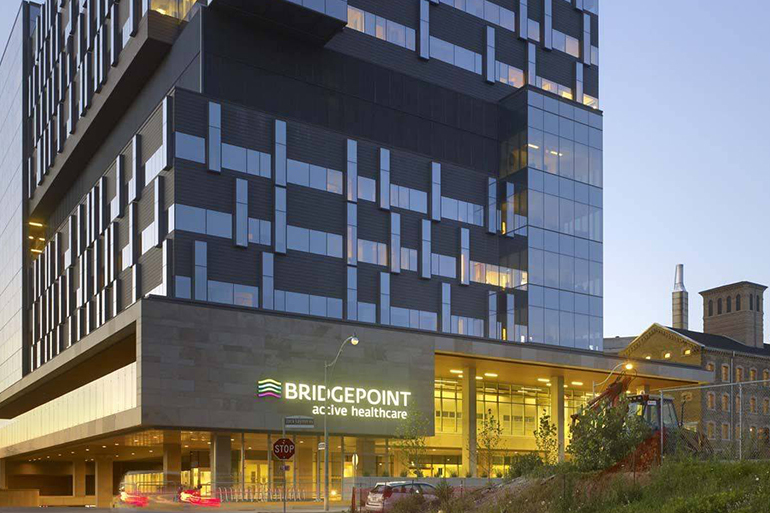 Having the Tools – To break the cycle of project cost overruns needed a fresh approach, which is where Alternative Financing and Procurement came in (the province’s public-private partnership model). Sharing risk between the public and private sector helped to break that cycle as contractors were now responsible for delays and had to deliver on what had been quoted. There are numerous problems with a low-cost bid approach that sees less focus on quality, and profits often being made through change orders as work is carried out. Having AFPs as a tool helped inject some reality into bidding and provided confidence that the price being paid was fixed. Another effective tool was the Ontario Strategic Infrastructure Financing Authority (OSIFA), which provided loans to municipalities and the broader public sector. Having Access to the Talent – Finally, having a body like Infrastructure Ontario was critical. As an agency Infrastructure Ontario became a centre of excellence in government for delivering infrastructure on time and on budget. It was also important that it could access a mix of skills, including bringing in external talent as needed to develop, negotiate, and oversee AFP contracts it required – the types of skills found in the private sector. Common Standards – There are 444 municipalities in Ontario and different building codes and standards for virtually all of them. The province could also do with standardizing things like contracts. To raise quality and reduce costs across the board requires greater uniformity and a major consolidation of those codes, standards and the paperwork that goes with them. This is difficult to do as many municipalities are fiercely protective of local standards, but it is an issue that ultimately needs to be addressed. Unlocking the Pension Funds – Ontario’s public pension plans lead the world in infrastructure investment but have been hesitant to invest at home. Two things are primarily cited by funds as reasons for not investing in new build infrastructure – the equity stakes are not big enough, and the risk in the construction phase in particular is too high. It will be interesting to see how the Canada Infrastructure Bank tries to solve this challenge and attract other private finance. A major challenge will be identifying assets with revenue streams. Consensus-Based Decisions – It is hard to be fully objective in developing infrastructure priorities – how do you compare a new hospital in Ottawa to a transit line in Hamilton? But given the frequency of elections and the timespan of projects, more should be done to ensure large scale priority projects have a sound business and community case based on expert opinion, and there is some degree of political consensus on that major project list. This could avoid costly cancellations every change in government. 2018 is election year again in Ontario. In June 2018 the province goes to the polls, then in October it is the municipalities’ turn. When it comes to infrastructure, the aftermath of elections can spell danger and sometimes opportunity. Thankfully there seems to be consensus across party lines on the need and the value of investing in infrastructure. Governments bear a great responsibility for the efficiency and productivity of the infrastructure sector, we have come a long way, but we can still do more.